Makers of tomorrow’s smart cities? The proliferation of networked sensors and distributed processing – the ‘Internet of Things’ – makes possible a fully embedded information infrastructure, a ‘city operating system’. ‘Big Data’ from smartphones, buildings, transit networks, and vending machines is mined, traded, and used to predict future patterns. This ‘ambient information’ turns the ‘Smart’ or ‘Cognitive City’ into an agent, a narrative partner in collective life, with its own beliefs, judgments and preferences. Traffic flow and garbage management, crime prevention and epidemic control alike become amenable to algorithmic management. Questions arise – who are these makers of tomorrow’s urban fabric? 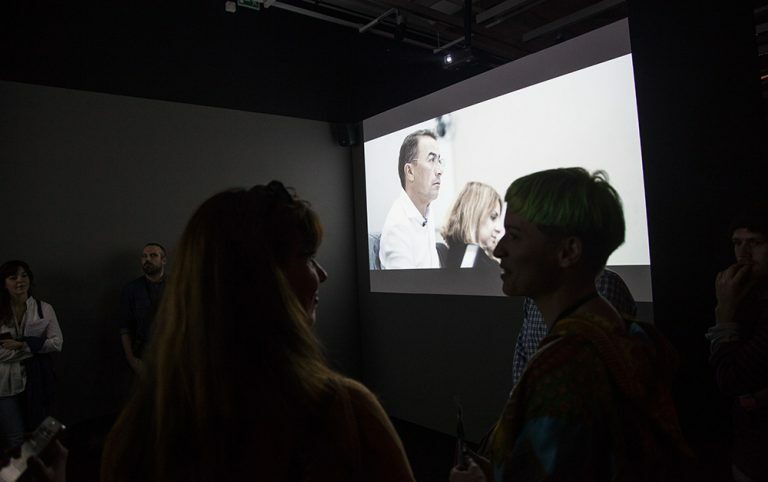 The film installation observes the 3Q report at Cisco Systems, as it leads the weaving together of data infrastructure and the built environment. Behind the quarterly sales figures and projections lie programs with immense transformative power over the new– programs whose long-term consequences deserve careful consideration.